This is a reprint of an article originally published on the older version of Da Game-Boyz. It has not been edited, including the original editorial mistake, as a complement to this article. The game scored a 7.5 overall, with 7 in half the categories, 8 in the other half. What the hell have I gotten myself into? First I got involved with some rebellion, and that led me to the headsman’s block, and then there was a dragon, and weird voices, and… now, I’m wandering through a dungeon killing some people called the Silver Hand because I didn’t realise my fellow warriors were actually werewolves! Heeeelp! Okay, so that last bit may seem like a spoiler, but it really isn’t. See, everything except the werewolves happened in my first hour of main plot play, and that last bit? I’m not telling you. 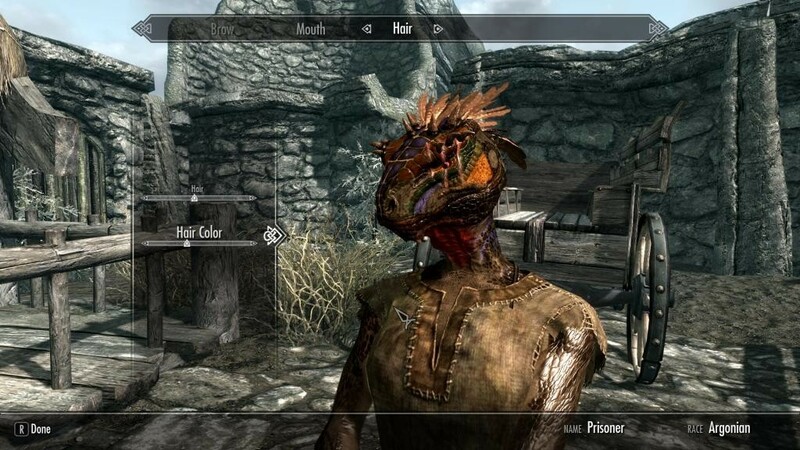 Skyrim, to those who don’t know (for shame!) is the latest in the Elder Scrolls series of RPGs, games with lore so deep, and so thick on the ground, that not even a +15 chainsaw could get through it all. The basic idea of this installment is that… well, after centuries of being who-knows-where (maybe having a good sleep? 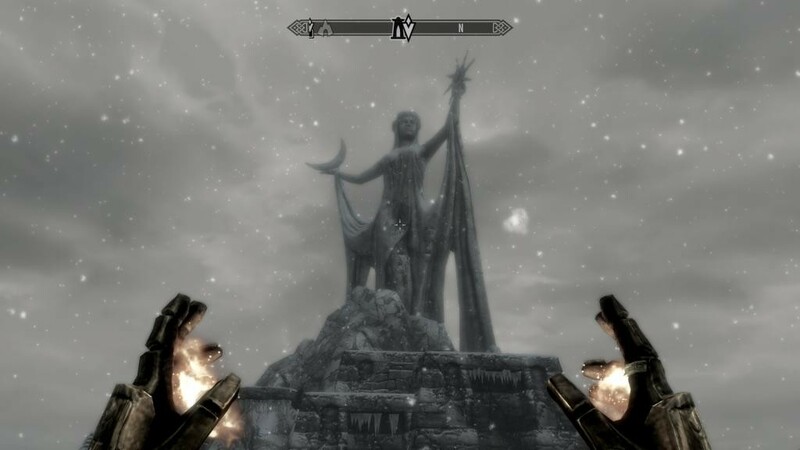 ), dragons have come back to the land of Tamriel, and you, through the usual Elder Scrolls mcguffin of the prophecy, are the fated one. Don’t let the corniness fool you, Bethesda are good at their job of storytelling, and I’ve seen them pull off cornier premises. In the same series. For those looking for an improvement from the last game graphically, there is… and there isn’t. See, the creatures and characters are even more beautiful to look at, although the character engine doesn’t seem to allow true obesity (if it did, my chargen abominations would have been so much more evil). So yeah, the characters look great, most of the creatures look great. Know what doesn’t look great? Watching trees suddenly pop into clarity in the distance as I run forward. On High settings. Seeing the base ground texture if I look at it in just the right way. But in dungeons, and when exploring ruins, my two favourite activities, it’s just fine, and the architecture, as always, is pretty damn stunning. Sure, the cities aren’t always great, but when you see a barrows with huge stone ribs poking out of the ground? You know you’re in high fantasy country, and the immersion skyrockets. If you’ve heard the soundtracks of Morrowind and Oblivion, you have at least some idea as to the music. The sort of music you’d hear while Aahnold and James Earl Jones have a good staring match, or when Aragorn is kicking righteous buttock. It fits with the theme, is stirring when it wants to be (in combat), and, while it’s nothing new under the sun, it’s still pretty cool. The Bethesda Curse, as it was known in gaming circles, is also much less evident here. No more does it sound like there’s maybe 5 voice actors phoning it in. It’s definitely quite a few of them, and only one or two characters sound like their lines are being read in a classroom. Combat sounds, similarly, are slightly improved, although it’s sorta hard to improve on “BASH, CLANG, THUMP, Urrrrggh!”. They still pull it off, and even manage to make arrows swoosh past. The one thing I personally found special however? The dragons. They’re obviously the focus of the action, and… wow. Every wingbeat sounds visceral, and the sound of dragonfire is audio-coded for “This will roast you. Hard.” Even the other creatures occasionally sound cool, like a wolf howl on the plains at night. How many are there? Daaaamn, can’t tell! And that, again, adds to the immersion. Skyrim is the first Elder Scrolls game to be designed for console accessibility, and, in places, it shows. Is this a bad thing? It’s not bad, it’s not good, it’s just different. For example, while the mouse controls for inventory and conversation choices are finicky (and downright annoying in the character creator, due to small sliders), using the keyboard is actually much simpler, and the interface itself has become a lot more user-friendly, with nearly everything do-able with just the direction keys, mouse buttons, E and Q keys. The obviously regenerating health (not ultra-speedy, we’re talking obvious to an RPG player here) feels sort of odd, but considering factors I’ll get to in a bit, it’s nonetheless welcome. What isn’t so welcome is the lack of HUD tips for things previous games told you, like the fact that you have a disease. Check your active effects semi-regularly people, because the messages are easy to miss, and I almost became a vampire, thanks to not realising I was about to catch it. Dual wielding finally came to the Elder Scrolls with Skyrim as well, and good god, it feels good… although instakills for both you and your opponent when low on stamina is a mixed blessing. 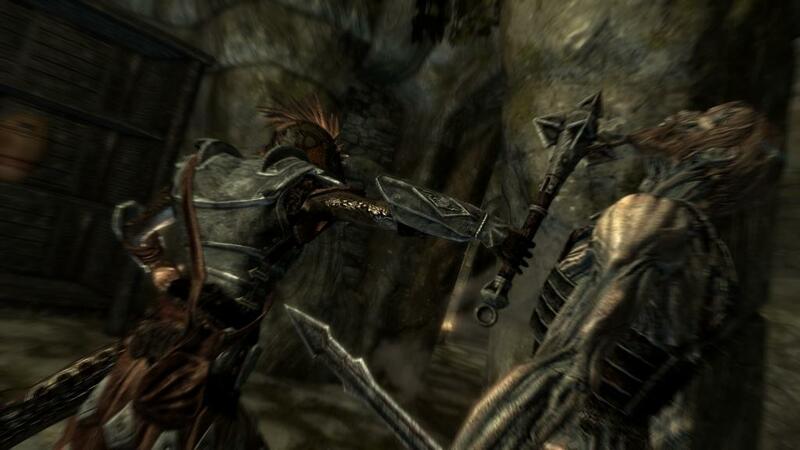 There’s too much to talk about in one sitting, so, with these examples in mind, I’m going to say that, where Skyrim gives with one hand, it takes away with the other. 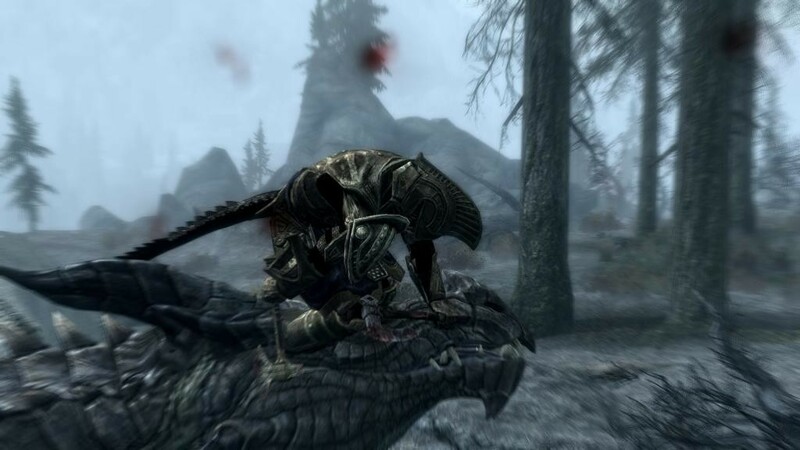 Argonians, for example, finally have some semi-regular use for that Water Breathing fix they had back in Oblivion, yet melee characters will quickly find themselves in large amounts of the brown stuff if they don’t also take mage and rogue skills. This isn’t much of a problem, because characters in the Elder Scrolls can learn anything they want, but pure melee characters are definitely a tougher proposition than in previous games. One thing that I will finish on is the difficulty. To say the difficulty in this game is erratic is like saying ghost chillis are “slightly warm”. One second, you can be happily slaying skeletons in single hits, and the next, a Master Vampire might lay the smackdown. Or you could be walking merrily along, slaying some bandits as you go, and… you hear the dreaded wing-flaps of a dragon, the screech that lets you know it’s seen you, and… you might as well savescum there and then until you’ve got some decent cutlery. It’s also quite glitchy, crashing while screenshotting, screwing up the Steam overlay on PC, and, in one instance, hurling me 200 feet up from a giant’s smackdown, only to crash as I tried to screenshot the awesome. And then refusing to catapult me when I reloaded the game and died again to try and bring you some awesome-sauce. Skyrim is good, but it’s a flawed good. 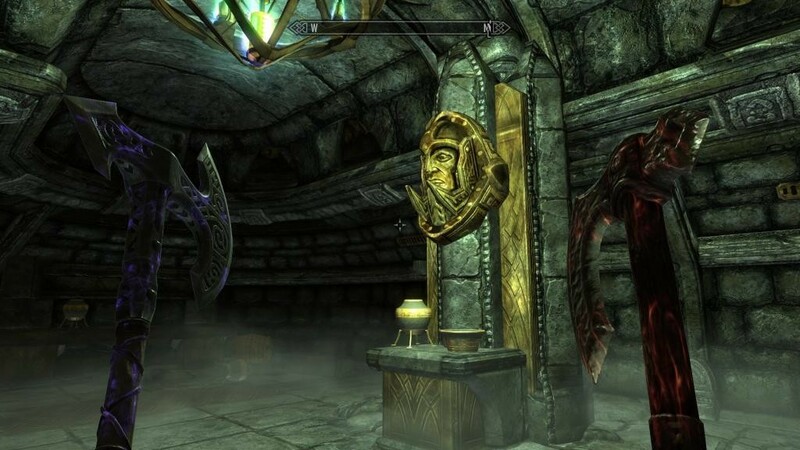 It’s a different experience in many ways to previous Elder Scrolls games, but, at the same time, it’s still the familiar world Elder Scrolls fans know and love. It has the usual kickass story, but the difficulty curve is a bit wobbly, to say the least, and, in general, it’s a story of give and take. I’d still give this my thumbs up, but only to RPG fans, as opposed to newbies to the genre. You want a “my first RPG” to ease you in, this isn’t it. 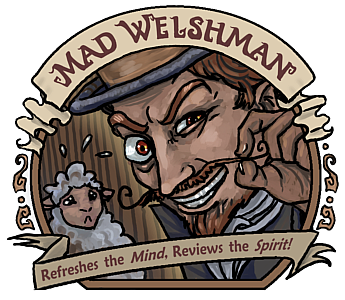 You want an entertaining, but sometimes frustrating experience? Go for it, empty your wallets, and don’t be like the douches who torrented this game with no intention of buying. EDIT: The review was written after 33+ hours, the specific paragraph was written 4 hours in. Apologies for the confusion.